Jojendi is situated in one of Johannesburg's quiet northern residential suburbs called Linden. We offer 4 Star self catering accommodation with pool and braai facilities. Jojendi is located close to Rosebank, Sandton, Randburg, Cresta and Johannesburg business, shopping and entertainment centres. It is 1 hour from OR Thambo International Airport and 45 minutes from Lanseria International Airport. Jojendi consists of 2 separate self catering units. 1 Downstairs and 1 on the upper level. Both cottages have 2 bedrooms and 1 bathroom with a shower. 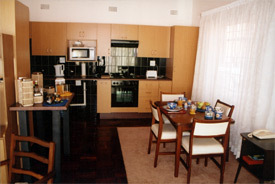 Both units have a fully equipped kitchenette, open plan lounge,dining room area and TV with Mnet. Only 1 car per room on the premises.